As you may have noticed, people are really loving our 1-Day floor coating system! This system seals your concrete flooring, protecting it from impact, moisture and weather damage. There are several common questions and answers that we would like to discuss. These questions will help you learn more about the flooring system, and how we can help! 1. Can you offer ballpark estimates? One of the most common questions we get asked is whether or not we can give out a general estimate without seeing the process. This may seem like a streamlined way to make sure that the project is right for you, and us! However, we feel differently. We could offer an estimate, but we feel that this just wouldn’t be very responsible! One of our goals is to give you the most accurate estimate possible, so there are no surprises or changes that you did not account for after the project has been started. Every project is different. Not only do we coat, but we also fill cracks and make minor repairs. That means that we need to see the space, and the surface, to offer an accurate estimate. 2. Do your coatings make the floors more slippery? Not at all! One of our favorite features about our floor coatings is that they have the texture of an orange peel. When finished, this actually adds traction rather than reducing it. We all know that concrete can become very slippery when wet. This floor coating adds an extra level of safety by providing you with a non-slip surface. 3. Can you coat outdoors surfaces too? Absolutely! 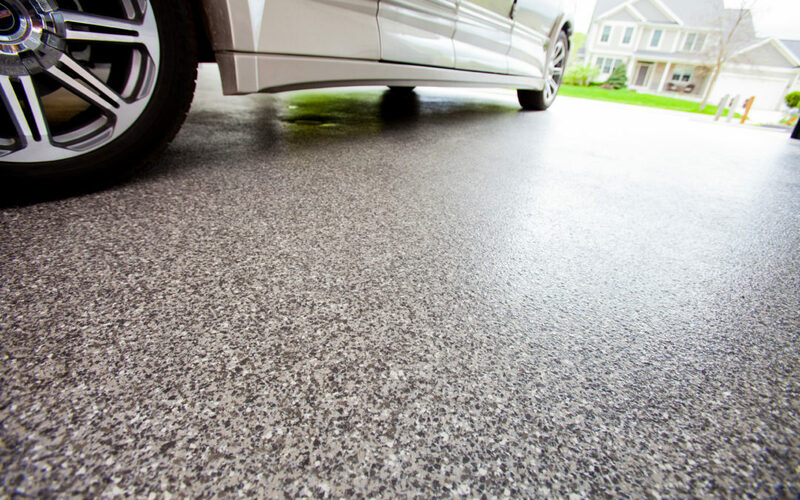 We have applied our 1-Day concrete floor coatings to all kinds of outdoor surfaces. Patios, driveways, poolside spaces, walkways, and more! The options are endless. Although it’s cold at the moment, it’s never too early to start thinking about spring projects. Schedule your free estimate today, and be the first to get on our spring calendar! 4. Can you really do the work in 1 DAY? This is another one of our favorite features about our 1-Day floor coatings. We can do small projects, all the way up to a standard 3-car garage in just one day! That’s impressive. This service keeps your busy schedule moving. There’s no downtime and no working around your home with our our team for a long period. 5. Can you add logos or designs? YES! We are able to customize any flooring to fit your unique style. We’ve added initials, team logos, university logos, and more. Or, let’s create unique color styles with the broadcast of your choice. We hope that this helps you with your research. Remember, it is always best to make an informed decision. If you have any more questions, or are ready for an estimate, please reach out to our friendly team! 1-Day Floor Coatings: Not Another Cement Paint!